Mr. Schwab you were here in 2008, is there a big difference this time? It is not such a big difference, but let me call it an "extraordinary" difference that has happened here in only a few years. I am rather somewhat unhappy not to be able to give you some critiques as everything is just marvelous, the people are nice and it is very clean and of high standard, most rings are large and some halls are somewhat dark, but that is something they cannot help, alike the weather that cannot be changed. As an observer I have had four very nice days, very little to do as everything goes so smoothly here. The big issue in 2008 was the traffic problems. It seems they are solved now. It is clear that they have made arrangements with the police and have blocked certain roads. Only the first day there have been some small problems, but no more than the usual problems on a first day of such a show. 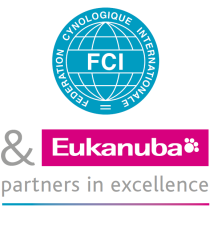 As FCI observer for the World Dog Show 2013, do you talk to the exhibitors in the first place? And what was your most remarkable impression? I walk around and talk to exhibitors that I meet: how was it to get in and so on, but I have not had any negative reactions at all. This surprised me a lot. I was also impressed by the high level of fair-play from the exhibitors, as I have never seen before so many being placed 4th and still leaping in the air of pure joy. And let us admit that ending 4th with so many dogs in competition is a very good result.